Jolie version de Good Vibrations pendant la tournée 76. En répète et en concert. Avec, cerise sur le "gâteau"... la McCartney family parmi les invités à l'anniv de Brian. Pas mal en effet, c'est bien reproduit pour du direct, sans bandes play back (1976) un truc "en famille" malgré tout qui tient la route...ils avaient mis combien de temps pour la faire? 6 mois??? Non, cette version live est catastrophique et dessert le chef d'oeuvre sorti dix ans plus tôt..
Il faut vraiment avoir les oreilles obstruées par des tonnes de cérumen pour trouver ça pas mal et surtout trouver des excuses à Brian Wilson et ses frères pour le gâchis immense qu'a été leur carrière. Et finalement, c'est quoi les Beach Boys, un album génial , quelques singles incontournables...mais in fine pas grand chose et beaucoup moins que d'autres grands groupes américains de cette époque comme les Byrds, Creedence ou CSNY pour ne citer qu'eux..
En comparaison, pourrait-on en dire autant du Come Together live à NYC? ...un peu dans l'esprit des Bohemian Rhapsody ou Strawberry Fields et quelques autres. Et je pourrais raccourcir mon propos en observant que ce que tout ce que poste un dénommé Filou suscite une réaction négative de ta part. Les Beach Boys sortent les sons de pets en reponses au revolver des scarabés, Paulo est estomaqué et se met sur le projet sergent pépère ! Brian (Wilson, pas Jones) veut répondre à son tour mais comme Clouzot (pas l'inspecteur, non, le réalisateur) avec "L'enfer", va se perdre dans les méandres de son génie et être mis sur la touche par "l'affreux" Mike Love (à qui nous "devons le dernier tube des Beach Boys, Kokomo...). Et voila le petit dernier. Enfin, on n'est jamais sûr de rien. Et là encore, difficile à résister, je crois bien. The fourth CD continues with more from Surf’s Up (Carl Wilson’s psychedelic tour de force “Feel Flows,” Bruce Johnston’s warmly nostalgic “Disney Girls (1957)”) before revisiting Carl and the Passions – So Tough (Jardine, Love and Carl Wilson’s Transcendental Meditation-inspired “All This is That,” Brian’s rocking “Marcella”), Holland (“Sail On, Sailor,” “California Saga – California,” “The Trader”), 15 Big Ones (“It’s OK,” “Had to Phone Ya,” an extended “Rock and Roll Music”), The Beach Boys Love You (the quirky “Solar System,” the ravishing “The Night is So Young”), M.I.U. Album (“Come Go with Me”) and L.A. (Light Album) (the back-to-basics “Good Timin,’” Carl’s “Angel Come Home,” Dennis’ “Baby Blue”). This CD also showcases the brief addition of Blondie Chaplin and Ricky Fataar to the line-up. But the rarities on this disc will most impress, including Dennis Wilson’s near-mythic “(Wouldn’t It Be Nice to) Live Again,” the Beach Boys’ original take of Brian and Steve Kalinich’s “California Feelin’” with Carl, Bruce and Brian on lead, and a 2012 mix of “It’s a Beautiful Day” from the Americathon soundtrack. The final CD offers 31 more unreleased tracks including a “Stack-o-Tracks” instrumental treatment of Glen Campbell’s “Guess I’m Dumb” (perhaps the best non-Beach Boys production ever by Brian Wilson), a cappella versions of “Slip on Through” and “This Whole World,” 15 Big Ones outtake “You’ve Lost That Lovin’ Feeling,” a demo of the dark “Be with Me,” the “California Feelin’” demo, and the outtake “Sherry, She Needs Me,” which became “She Says That She Needs Me” on Brian’s Imagination album. Radio spots and BBC performances also appear on this exciting grab-bag of vault material. Et dans le dernier Record Collector, ils racontent tout, tout, tout. The Beach Boys are about to release Made In California, a major box set where classics jostle with rare gems. To celebrate, the band talk frankly about their incredible career to Ken Sharp. The location: 3701 West 119th Street, Hawthorne, California. It’s 1960. Holed away in his family’s music room, 18-year-old Brian Wilson, future music genius/visionary of The Beach Boys, is cocooned in his private sanctuary, immersed in what would become his life’s quest and salvation: making music. 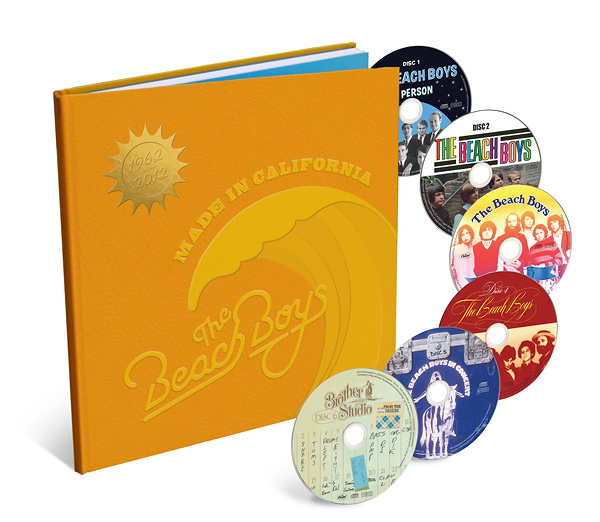 “All these years later, Made In California, an expansive 6-CD career-spanning retrospective, crammed with essential singles and deep album cuts, along with a generous helping of previously unreleased live and studio tracks, offers definitive proof of the enduring glorious legacy of Brian Douglas Wilson, his brothers Carl and Dennis, cousin Mike Love, Al Jardine, David Marks and Bruce Johnston. From the rudimentary 1960/61 rehearsal version of what would become their first hit, Surfin’ to Soul Searchin’, the last track to feature the late Carl Wilson, Made In California is manna for Beach Boys fans and serves as a towering monument to 50 years of incomparable musical invention. RC spoke to The Beach Boys to hear what they think of the box set and to discover what memories it has triggered for the members of the group. Et puis aussi, une revue audio de la box repiquée sur une station de radio US. Quelques petites trouvailles déterrées pour l'occasion extraites du premier volume des sessions de 1964. A partir du deuxième volume (1965/67), on constate l'évolution rapide du groupe et tout le travail sur les harmonies. Comme j'ai été très sage, le père Noël devrait m'amener ça dans sa hotte le 24 ! 2004: Brian and Paul McCartney listen to a playback of their duet, "A Friend Like You."